Description of Venue: Driving into Dean it is clear that this magnificent hall is the hub of the community. 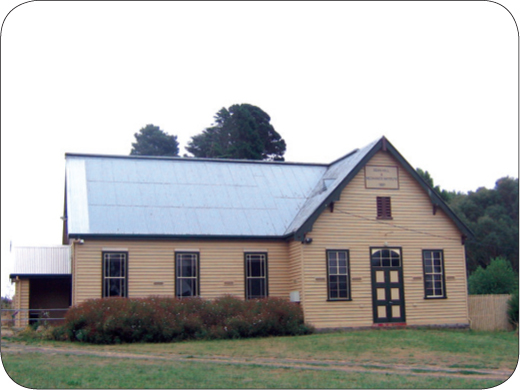 Dedicated community members have lovingly restored this historic 115-year old hall. Funded by grants from multiple levels of Government, the hall has had significant refurbishment which was completed in September 2006. 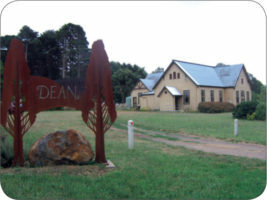 The Dean Hall Committee runs regular events and family activities, produces a quarterly publictaion, ‘The Dean and District News’ and holds working bees and hires the hall for functions, film nights and weddings. There are also regular Christmas parties, trivia nights, Spud Dinners & AGMs. It is an ideal venue for weddings and parties as well as smaller, more intimate gatherings such as local meetings and family nights. Overnight camping, (full shower facilities including disabled access) is also available as the Hall is a recognized stop on the Great Dividing Trail Walking Route. The Hall committee maintains a collection of historical photographs, trophies and Honour Rolls which recognizes the participation members of the Dean Community. With the refurbishment, the Hall is now fully equipped with state-of-the-art split system heaters, ceiling fans while retaining the romance of an additional wood fire. The furniture has been upgraded and can seat about 100 people at tables. The large stage and original stage curtain (a painting of a Loch, completed in 1921), make the venue ideal for performances, live music and film screenings. The Hall also owns a data projector, amplifier and speakers. Toilets: Internal- one male and one female. No disabled toilet access. Kitchen: The kitchen is fully equipped with crockery and cutlery to serve a large wedding, as well as a large fridge, microwave, oven/stove along with a pie warmer. Stage: The large stage and original stage curtain (a painting of a Loch, completed in 1921), make the venue ideal for performances, live music and film screenings.